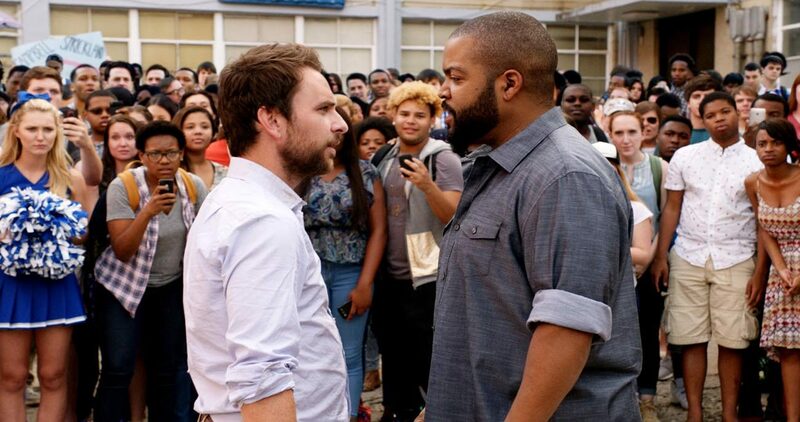 NEW YORK (CNS) — We have to inquire: What kinds of audience laughter are the makers of the misbegotten “Fist Fight” (Warner Bros.) going for? Broad guffaws at human frailties? Nope, none of that. Expansive hoots at outrageous physical comedy? Again, not here. That leaves bitter, humorless sneering at various forms of human degradation. If there’s a sweet spot for that, this film has found it. Director Richie Keen and screenwriters Van Robichaux and Evan Susser have constructed this unpleasant mess as a series of dirty jokes. It’s the last day of the academic year at a crumbling Atlanta public high school, which has a tradition of year-end senior pranks. So a lot of these, usually involving crude sexual imagery or animal abuse, go on while the faculty worry about impending layoffs. Nebbishy English teacher Andy Campbell (Charlie Day) is fearful of losing his job because his wife is pregnant. And Strickland (Ice Cube), the only member of the staff who actually stands up to the pranksters, does so with nearly feral outbursts in a misguided attempt to maintain his dignity and authority. Finally, Strickland has had too much of the high jinks and, with Andy in tow, goes after a student with a fire axe. Principal Tyler (Dean Norris) then has to decide, before the last bell, which one of the two is going to get the figurative axe as a result. With some urging from Andy, he chooses Strickland. So Strickland challenges Andy to an after-school brawl in the parking lot, and the ensuing complications take up the rest of the plot — with much ridicule directed at Andy’s fears along the way. The film contains strong sexual content, including pornographic images and masturbation, drug use and pervasive rough and crude language. The Catholic News Service classification is O — morally offensive. The Motion Picture Association of America rating is R — restricted. Under 17 requires accompanying parent or adult guardian.